I was going to say, “Nineteenth-century American paranormal literature has never been this fun!”, but then, nineteenth-century American paranormal literature is actually a whole lot of fun on its own. But so is this book, the third in a loosely-connected series by Polly Shulman celebrating imaginative literature by imagining that objects from it exist in our world. 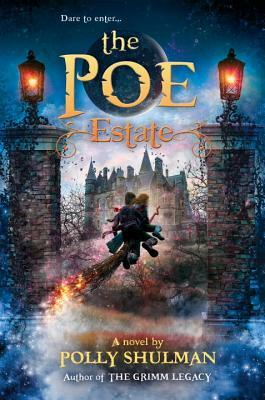 I enjoyed all the literary references, even though I hadn't read most of the books mentioned, and I liked the way the main character matured over the course of the story too. I will definitely be keeping an eye out for further books by Shulman! This is a mind-bending, rousing adventure celebrating classic ghost and horror stories, by the author of The Grimm Legacy and The Wells Bequest. Sukie’s been lonely since the death of her big sister, Kitty—but Kitty’s ghost is still with her. At first that was comforting, but now Kitty’s terrifying anyone who gets too close. Things get even weirder when Sukie moves into her family’s ancestral home, and an older, less familiar ghost challenges her to find a treasure. Her classmate Cole is also experiencing apparitions. Fortunately, an antique broom’s at hand to fly Sukie and Cole to the New-York Circulating Material Repository’s spooky Poe Annex. As they search for clues and untangle ancient secrets, they discover their histories intertwine and are as full of stories of love, revenge, and pirate hijinks as some of the most famous fiction. Polly Shulman (www.pollyshulman.com) is the author of The Grimm Legacy (a Bank Street Best Book and Mythopoeic Fantasy Award Finalist), its companion The Wells Bequest, and Enthusiasm (a New York Times Book Review Editors' Choice). She has worked as a magazine editor, a newspaper columnist, a library page, and a licensed private investigator. She has written for many newspapers and magazines, including The New York Times, Discover, Newsday, Salon, Slate, Scientific American, Archaeology, and The Village Voice. She majored in math at Yale and grew up in New York City, where she lives with her husband in a tall old building guarded by gargoyles.